We’ve had two deaths on the A12 in the past three weeks: let’s try to avoid more. A bit further south of the tragic Bow roundabout, there is another fatal accident waiting to happen. 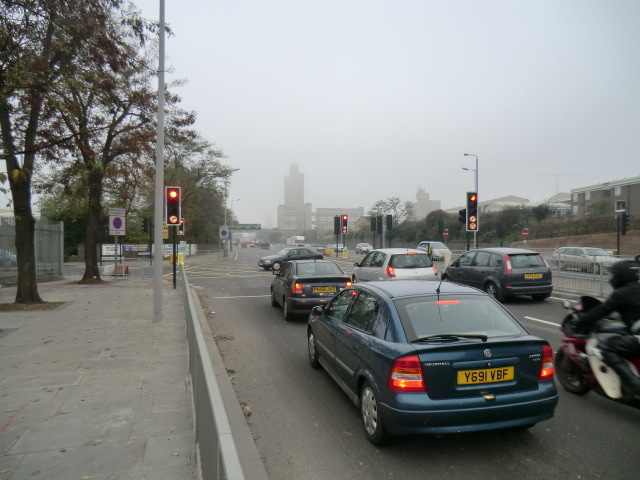 Anyone who drives that road regularly, particularly northbound from the Blackwall Tunnel will know what I’m talking about: the most illogical set of traffic lights in Britain. The A12 Blackwall Tunnel Northern Approach is the one of the capital’s busiest and most accident-delayed roads. There are tailbacks every day in both directions near the tunnel entrance. The road is three lanes in both directions. 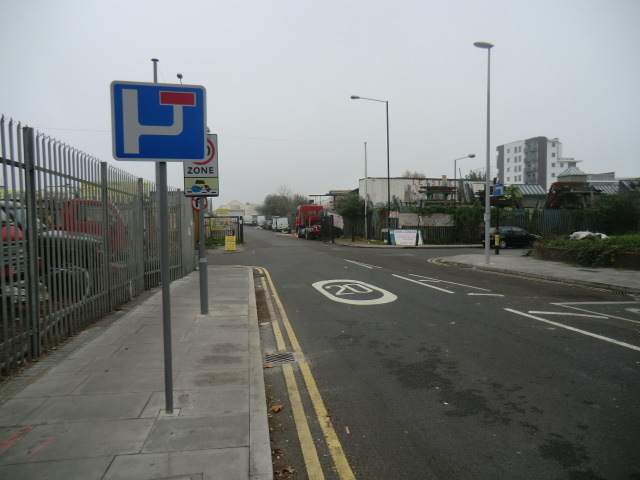 So the brains at TfL have come up with the ingenious idea of placing new traffic lights – the first ones you will see driving south from the Redbridge roundabout eight miles away – right by Lochnagar Street about half a mile from the tunnel. ie scrap yards and a no-through road that leads into a small housing development that can already be accessed from Newham. The lights have apparently been put there to allow future residents from Newham better access to the A12. I stood there, as you do on a foggy Monday, watching the traffic flow. How often do you suppose those lights on the sometimes congested, sometimes fast-flowing A12 change to red? Yes, the flow of traffic on the A12 is stopped every minute to let, on most occasions, a single car either turn into or out of Lochnagar Street. As you drive north from the tunnel or from the slip-road from East India Dock Road 300 yards away, there have always been three lanes of traffic. There still is. And as you’d expect, those in the fast lane tend to out their foot down. But now the problem is this: just as they’re accelerating, they suddenly realise – because there is no prior warning anywhere – they are rapidly approaching a red light in what has now become a right-hand-turn only lane. Since 99.99 per cent of those drivers do not want to visit a scrap yard, they brake very suddenly, indicate left and try to squeeze into the middle lane where there is fast-flowing traffic. I watched that happen time and time again today. One car swerved to avoid an accident. And that was in the space of just 20 minutes. I also saw motorists realising they couldn’t get back into the middle lane and accept they’d have to turn right: they would wait for the green light, turn into Lochnagar Street, do a U-turn and then wait by the red light for the turn back onto the A12. Cursing all the while as they did so. If a high speed accident hasn’t already happened at that junction, I’m fairly sure that without any change of plan by TfL there will be one soon. London Assembly member John Biggs is also taking up this issue and has already met TfL. His warning was not heeded last time; let’s hope they now listen to any concerns. A few months ago Labour’s London Assembly member John Biggs warned Boris Johnson and Transport for London that there was “an accident waiting to happen” on his “cycle superhighway” at the Bow flyover roundabout where the A11 meets the A12. Three weeks ago on October 24, he was sadly proved right when Brian Dorling, a 58 year old cost consultant at the Olympics site was killed as he cycled to work going east. Flowers left in tribute are still there. At about the time I was talking to John about that and other matters last Friday, which I’ll come on to in another post, a 34 year old Ukrainian woman was killed cycling across the same roundabout but on the other side going west. The brilliant blogger Diamond Geezer is the authority on this, but let me outline here John’s concerns. They were that there was and is a design fault, not only with the roundabout but also with the cycle lane itself. Anyone who has driven around that roundabout in a car can testify how dangerous it is. It’s very busy and vehicles jostle, often without any road etiquette, for position in two lanes for their particular exits. You are looking in your mirrors the whole time; there are buses and trucks to deal with; and for trucks, there are sometimes idiotic cars. Yes, there are some idiotic cyclists as well. As someone who loves cycling but who hates cycling on London’s roads, I would avoid that roundabout. Yet some idiot in Transport for London, probably aided and abetted by some fools in Tower Hamlets council and the Olympics organising team, have routed their Cycle Superhighway 2 (CS2) right across it. 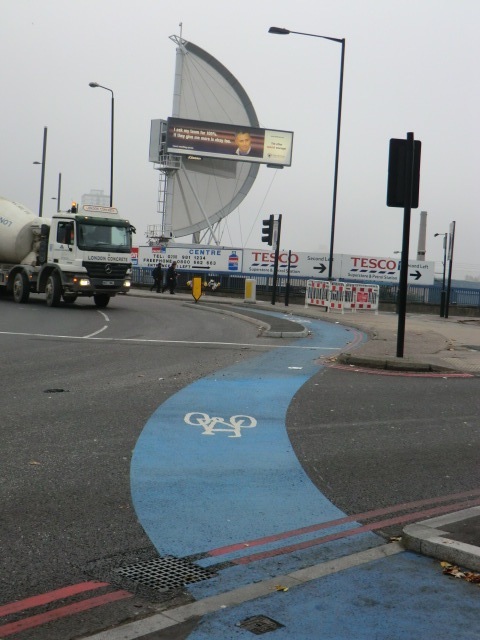 It means that the cycle lane, travelling westbound, is one big thick blue line that comes down from Bow Road in a continuous paint-job without any breaks for traffic lights or Give Way signs. If you’re a pedestrian walking back from Tesco, or for any other reason, trying to cross the slip roads which cross that roundabout really is dicing with death. I watched several mothers with prams try it today. There are traffic lights which stop the traffic on the slip roads leaving the A12 but no pedestrian crossings. Trying to cross those slip roads which enter the A12 is like a game of chicken. As you can see from the first photograph above, there were officials monitoring something on the roundabout today. I thought they must have been TfL people, a sign that they realised the seriousness of the situation. Sadly, no: they were from Crossrail; they were reviewing the plans for that project. 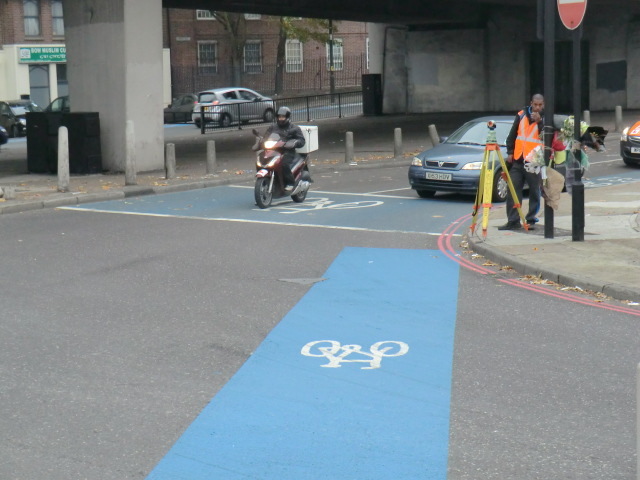 As John Biggs has been saying for months and as others are now saying, that roundabout and the cycle superhighway needs an immediate redesign: it is madness to direct cyclists across such a dangerous junction – just for political expediency. There are two other issues on the A12 in that area, which I’ll deal with in another post. The below has just appeared on the Court News UK website. I don’t have any more details yet. I had heard this was going to happen and it relates to this piece from last year. A Bangladeshi newspaper editor accused of publishing false information about a politician ahead of an election has appeared in court. 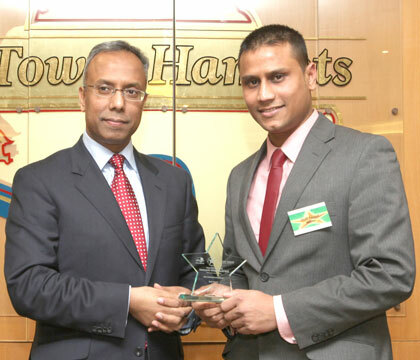 Shah Yousuf, who runs the London Bangla newspaper, printed a story allegedly containing lies about Helal Abbas, who stood as a candidate in the Tower Hamlets Mayoral Election last year. Yousuf is on the right.